If there is any part of Philadelphia that can be said to resemble New York — and I’m sure I’m going to get flak for suggesting that such a thing exists — it’s Old City, the place where Philadelphia began. It boasts the type of 19th-century commercial architecture that you find in hip New York neighborhoods like SoHo and Tribeca, and it has an art gallery scene to rival either. Yet it remains distinctively Philadelphian in the way it looks and feels, and it’s not just because of Elfreth’s Alley or the Betsy Ross House. This full-floor condo atop a onetime industrial building on North Orianna Street now captures this Old City duality perfectly. When this building was built in the mid-19th century, it was in the heart of the city’s light industrial district. It housed the Brecht cigar box factory, and its neighbors in 1897 included the Smith, Kline and French “wholesale drug store” and the Curtis Publishing Company, whose later headquarters this publication now occupies. A company called JT Four Enterprises bought it in 1977, then sold it to an owner who converted it into residences in 1999. He kept the top floor for himself and turned it into a loft-style apartment whose centerpiece was an open kitchen with a hibachi grill. 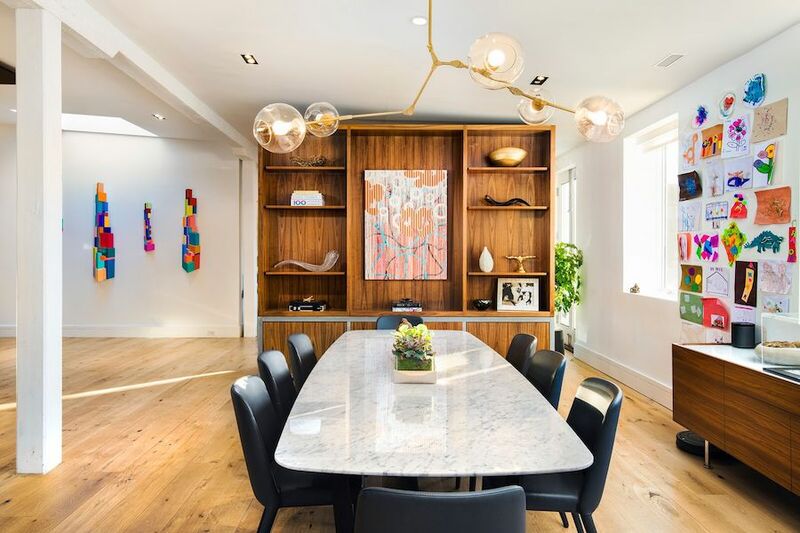 Its current owner, who bought the home in 2014, turned this funky loft with a Benihana kitchen into a real modernist showcase that blends art (the owner’s collection) with artistry (everything else). Its main living area pulls off a rare feat: it follows an open plan yet consists of several distinct interconnected spaces. 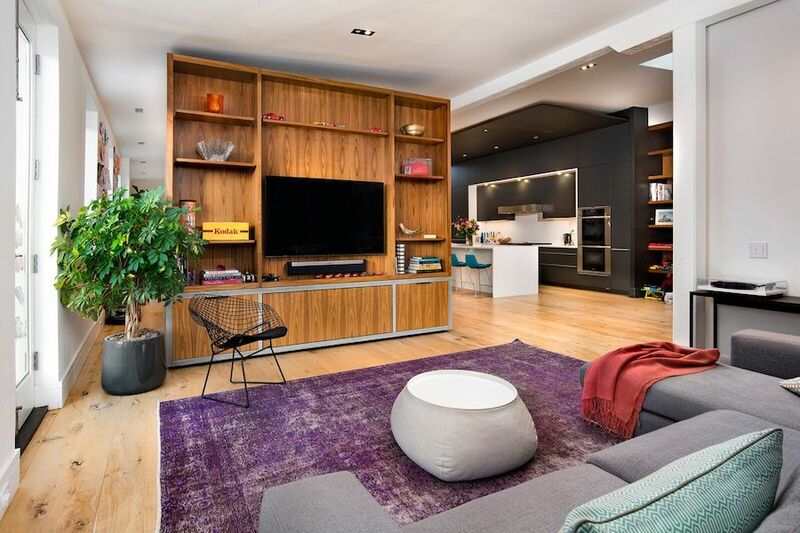 Built-in cabinets and gallery-style walls serve as the main performers of this magic trick. They enable the living room to feel intimate even with its high ceiling, and they turn the dining room and kitchen into a standout space. Speaking of that kitchen: Have you ever wanted to host your own cooking show? 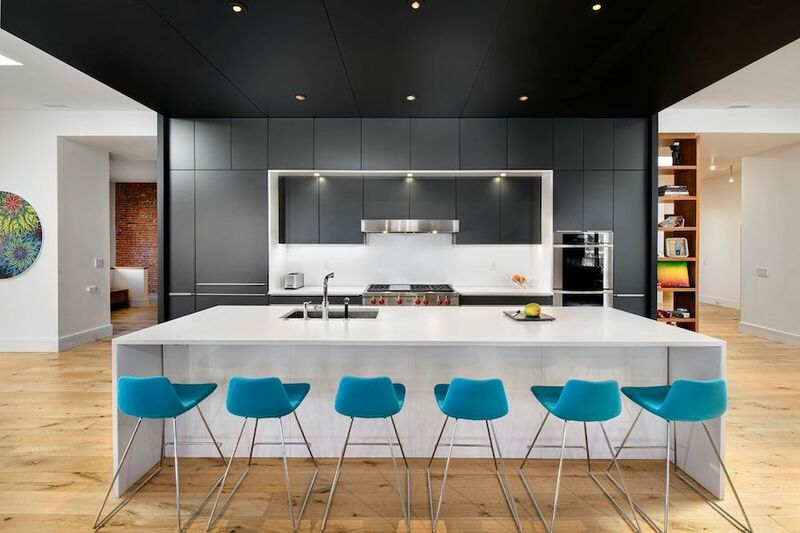 The Poggenpohl kitchen in this home looks like the stage set for the cooking performance of a lifetime, and it has the equipment for you to pull it off. Just put a camera in the dining room and go. Or better still, invite your friends over to serve as the “studio audience” at its bar seats. Another bit of inspired design is the master suite, where curtains and pendant lights provide the drama. 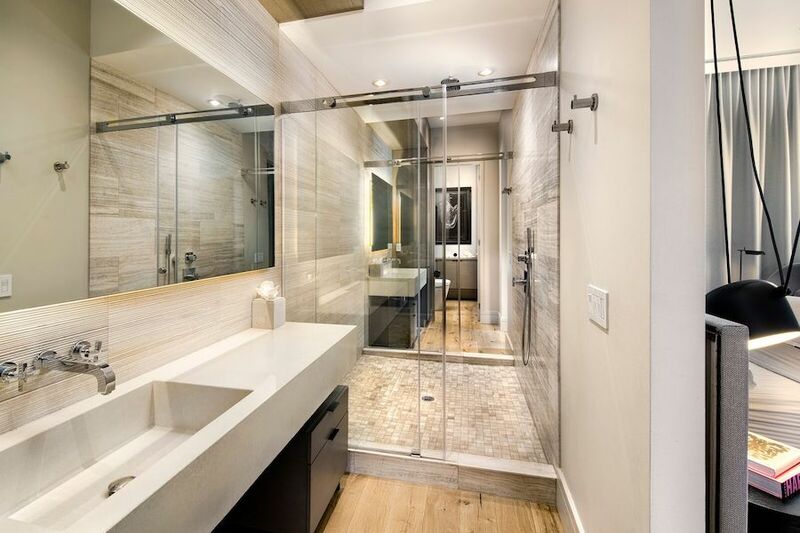 In addition to huge walk-in closets, it features the most intelligently designed master bathroom I’ve ever seen: its dual vanities lie on either side of a walk-through shower, and there’s a door on each side of the bed that leads to one of the vanities. A dual-career couple can do their morning routine without getting in each other’s way — unless, that is, they want to in the shower. 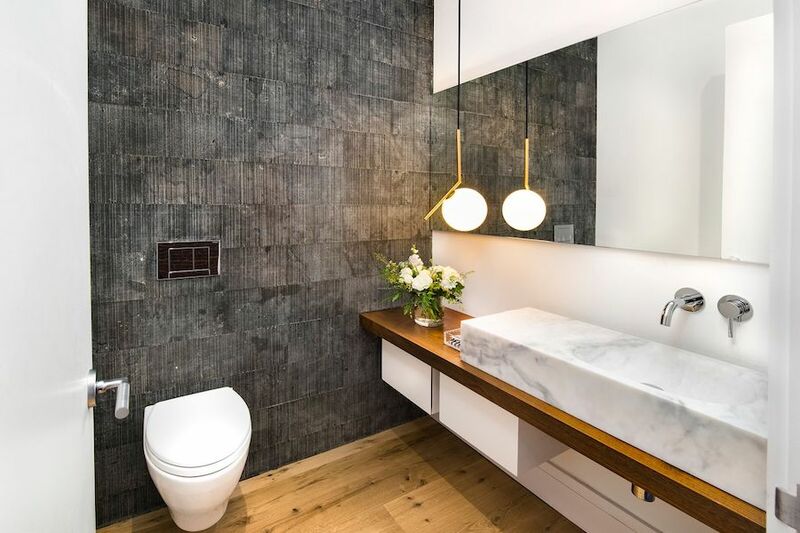 Architect Gabrielle Canno of Canno Architecture & Design and contractor Dan Nissim of DN Construction did themselves proud on this renovation, and Bridgette Mayer Gallery and I. Brewster & Company supplied most of the artwork that graces the walls of this home. 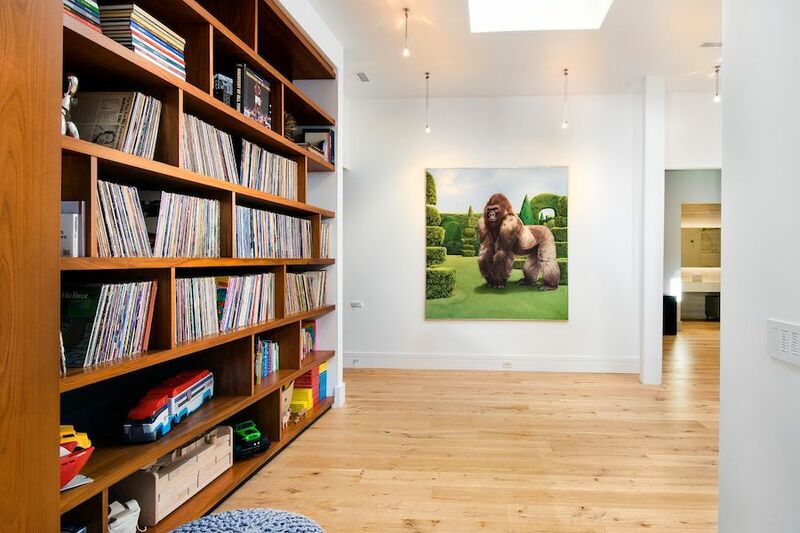 The mural in the kids’ bedroom, however, is an original work by local artist/photographer Alloyius McIlwaine, whose graffiti-inspired work has been displayed at Art Basel. Wait. Did I say “New York sophistication” up at the top? Forget New York — this is pure Philly, through and through. 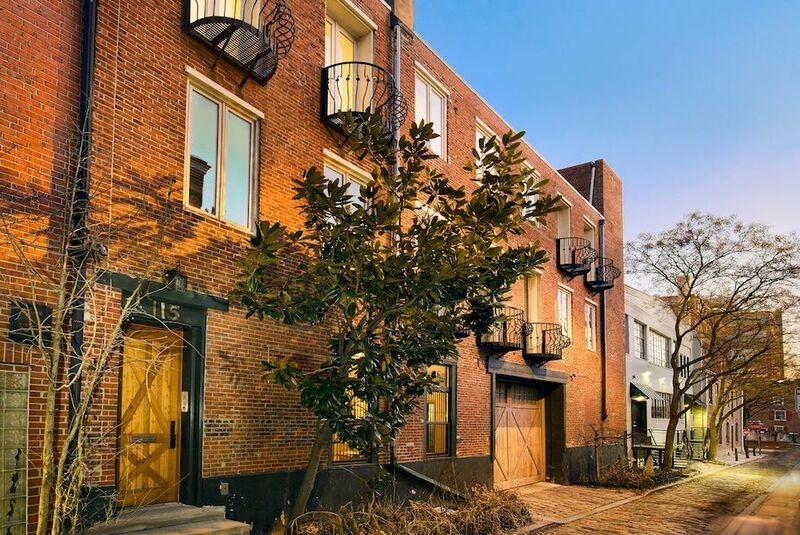 OTHER STUFF: Along with the space listed above, this unit comes with garage parking for four cars, storage space on the building’s first floor, its own private elevator for access and the potential for even further transformation. An easement for the roof of the building to its north serves as a 900-square-foot outdoor terrace; an identically sized terrace could be built on an unused easement for the roof to its south. The unit’s previous owner had also obtained permits for a 2,800-square-foot addition on its own roof. You could always dust them off if you like with a trip to Licenses & Inspections. Updated May 17, 9:11 a.m., to correct the date the current owner purchased the home.